In the May of 1900, a group of workmen were labouring on a hillside overlooking the loch. Slotted in to a crack in a rock, one of the workmen felt something. Something that didn’t feel like a stone, a plant, or a spider. What he had found was quite remarkable, and the last person to see it had been dead for the best part of four thousand years. Piece by piece the workmen extracted the items. There was a bronze axehead, some jewellery including armlets or anklets, six buttons for a jacket, and items which might once have been attached to a head-dress. It is quite possible that they were in a bag which has since rotted away. Apart from the buttons, everything was made from bronze. When the buttons were analysed, scientists discovered that five of them were made from cannel coal or shale, but the sixth one was made from jet. This type of jet is not found in Sutherland; it is found near Whitby in Yorkshire. It had been traded from 450 kilometres away. These items, finely crafted objects made from precious bronze, and a button imported from a great distance, were of high value. They must have belonged to a person of great importance. Wearing the objects would have demonstrated that the owner had the wealth to spend on skilled craftsmen and access to far-flung trading networks. They were expressions of power and prestige as well as beauty. How did such valued items, possibly belonging to a military and political leader of this part of east Sutherland, end up in the crack of a rock? Sometimes such hoards appear to have been hidden away. It is quite possible that Sutherland in 2000BC was not a peaceful place. It might have been that the items were hidden away in a time of war or raiding to ensure that they did not fall into the hands of enemies. Perhaps the owner intended to return for them but was killed in battle, or was captured, or was enslaved. Archaeologists at the National Museum of Scotland feel that it was likely that the hoard ended up in the rock for a quite different reason. They think that the items were placed there as a gift to the gods. It may have been that the local community needed something from the gods: perhaps they had been suffering a time of famine, disease or attack. Perhaps they thought that a sacrificial offering of the most valuable items that the community possessed would persuade the gods to relieve their suffering or to give them something good: perhaps victory in battle, perhaps a good harvest. Perhaps it was a sign of repentance for some evil that had been done. It is impossible to guess what these items symbolised and why they were hidden away. But the objects do tell us a little bit about Bronze Age Sutherland. 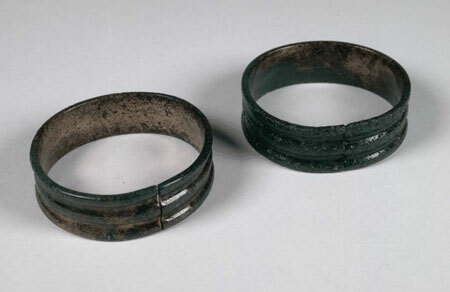 ‘These two bronze anklets were found at Migdale in Sutherland in a hoard containing an axehead, jewellery and dress accessories. The dress accessories reflect female fashions in central and northern Europe between 2250 and 1950 BC. The hoard tells us that the inhabitants of Migdale four thousand years ago were far from being isolated. There were clearly trading links to Yorkshire. Perhaps traders sailed up the east coast to sell their wares, or perhaps they travelled on foot, or perhaps items were traded from person to person and gradually the jet button made its way into the hands of a chieftain in the far north. The remains of the head-dress and the axe show how connected the population was with Europe. Their design echoes the fashions of Central Europe. This fits with other archaeological evidence that we have which tells us that there were links between north east Scotland and central Europe. A hundred years ago, the workmen took their precious find down the hill. It was sent to Edinburgh to be examined, and it can still be seen there on display. Key information was also taken from an interpretation panel on the north side of Loch Migdale, designed by the Kyle of Sutherland Initiative by the National Museums of Scotland, 2005. 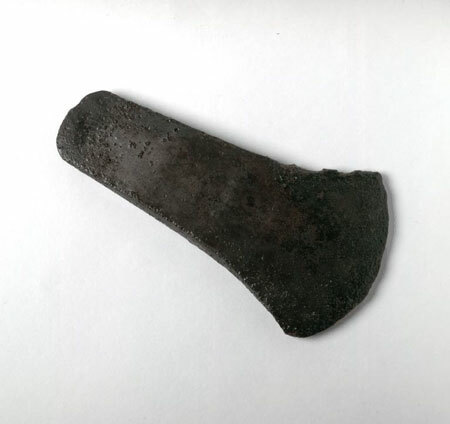 This entry was posted in Archaeology, Art and Literature, Economic and tagged anklet, axe head, Bronze Age, cannel coal, Migdale by elizabethritchie. Bookmark the permalink. Good grief! Thank you for spotting that. The sort of thing I criticise my students for continually!